"America First Committee Des Moines"
Heroism can be unmercifully hard on Heroes. The daring feats of youth can provide a "bully pulpit" for the rest of one's life, even when the audience will not agree with your views. This celebrity is earned by deeds but can include the cost of becoming a target of decidedly unsavory elements. Still, life is a long journey and a true hero will be able to endure more than one reversal of fortune. Such is the story of a little-known Minnesota farm boy who would bravely pilot his frail aircraft nonstop from New York to Paris and capture the imagination of the World. Charles A. Lindbergh, born in Detroit, Michigan, 1902, was the third child of Swedish immigrant Charles August Lindbergh whose family had settled in Minnesota when he was an infant. The senior Lindbergh earned a seat in the US House of Representatives in 1906 as a Republican, he would be one of the few members of Congress to oppose America's entry in the First World War. He left office in 1917 after an unsuccessful bid for Congress. The future aviator's parent separated when he was seven. His mother was a high school science teacher and Charles demonstrated an aptitude for the mechanics of motorized transport form an early age. He enrolled in the College of Engineering at the University of Wisconsin-Madison in 1920 but dropped out during his sophomore year to pursue flight training. He joined the flight school of the Nebraska Aircraft Corporation in February 1922 but was not allowed to "solo" because he could not afford to post the required damage bond. To gain experience and earn money, he spent the summer with a barnstorming troupe as a wing walker and parachutist. Lindbergh returned to his father's farm in Wisconsin for the winter and by May he had saved enough cash to travel to Georgia where he purchased a surplus Curtis JN-4 "Jenny" for $500. After half an hour of dual instruction with another pilot purchasing a Jenny Lindbergh decided he was ready to solo in his own aircraft. Lindbergh spent the summer of 1924 barnstorming, now as "pilot-in-command" of his "own ship". During an episode of flooding in Wisconsin, he transported a local physician over the Wisconsin River on at least two emergency calls. He experienced a number of "crack-ups", usually broken propellers from rough field landings, but he always managed to repair his ship to get back in the air. In the spring of 1924, he temporarily gave up barnstorming to train with US Army Air Service. He graduated as the best pilot in his class and earned a commission as a Reserve 2nd Lieutenant before returning to barnstorming and flight instruction. The Robertson Aircraft Company of St. Louis hired Lindbergh in the fall of 1925 as an instructor and chief pilot. Here he gained a reputation as a capable and cautious pilot on the airmail route between St. Louis and Chicago. New York hotel owner Raymond Orteig had offered a $25,000 prize in 1919 for the first aviator to fly non-stop between New York and Paris (in either direction). The Atlantic had been crossed by air, from Newfoundland to Ireland by British aviators in 1919, but their route was little more than half the New York to Paris distance a feat which would kill several pilots in the attempt. 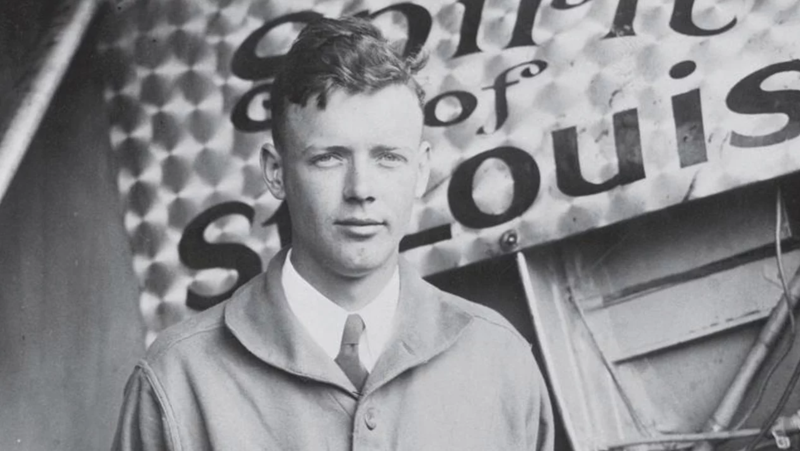 Despite Lindbergh's relative obscurity, he managed to convince a group of St. Louis businessmen to provide financial backing for a trans-Atlantic attempt. The group contacted several aircraft manufacturers to purchase a suitable plane, but the companies insisted on putting their own pilots in command. Finally, tiny Ryan Aircraft Corporation in San Diego agreed to work with Lindbergh on his terms. The Ryan NYP ("New York to Paris") first flew in April 1927 and dubbed Spirit of St. Louis for its financial backers. 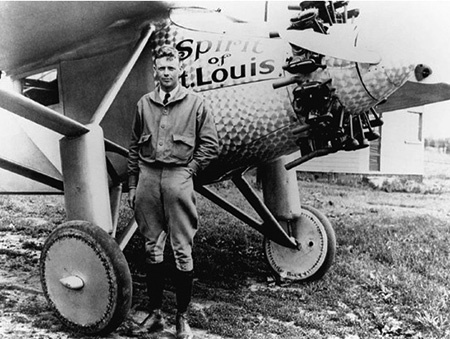 Lindbergh flew the fabric covered monoplane to St. Louis and then to New York to make final preparations. Primitive radio direction finding gear was available, but Lindbergh rejected installing any, feeling it would be heavy and unreliable. However, he had no experience with celestial navigation, so was forced to navigate by dead reckoning (which was his only choice anyway, much of the route was through fog and clouds). With a fuel load of 450 gallons, he took off from Roosevelt Field on the early morning of May 20, 1927. 33 1/2 hours later, just after 10 pm Paris local time, he found himself over Le Bourget Aerodrome. At first, he thought the aerodrome was an industrial facility, he was confused by the headlights in "the largest traffic jam in Paris history" as thousands of French hurried to the airfield to see the historic landing. USS Memphis (CL-13) was dispatched to bring "Lucky Lindy" and the Spirit of St. Louis back to American shores. The cruiser's trip up the Potomac and the aviator's triumphant entry to the Capital were recorded by newsreel and radio broadcast. President Coolidge awarded Lindberg the Distinguished Flying Cross and parades were held in his honor at most big cities he visited. He was promoted to Colonel in the Air Corps Officer's Reserve, a special act of Congress awarded him the Congressional Medal of Honor (normally reserved for displays of heroic bravery in combat), and in January he was named Time magazine's youngest ever Man of the Year (a record which still stands). Lindbergh began working tirelessly to promote the practical uses of aviation. He toured Central and South America, and he was introduced to Anne Morrow, the daughter of the US Ambassador to Mexico. Lindbergh married Anne in 1929. He taught her to fly and she accompanied him on several of his exploration flights. On March 1, 1932, Charles and Anne's oldest son, then 20-month old Charles Lindbergh Jr., disappeared from the nursery at the Lindbergh home in East Amwell, New Jersey. A $50,000 ransom was paid, but on May 12 the child's remains were found in the woods not far from his home. Dubbed "the crime of the century", Congress responded by passing the "Lindbergh Laws" which made kidnapping a Federal crime if the victims were transported across State lines or if the US Mail was used to further the crime (i.e., delivering a ransom note). A carpenter named Bruno Hauptman was arrested for the crime after using some of the ransom money (the serial numbers of the bills had been recorded). More ransom money was found in Hauptman's home. He died in the electric chair at Trenton State Prison on April 3, 1936. To escape the circus atmosphere surrounding Hauptman's trial and execution, and fearing for the life of their second son, Jon, the Lindbergh's secretly boarded a steamer for Europe. The family lived and traveled extensively in Europe. A second son was born, and Lindy was a guest of the German Luftwaffe on several occasions with the German Air arm delighted to share their latest air technology with the America flyer. The Lindbergh's returned to America when General Hap Arnold, chief of the Army Air Corps, called Colonel Lindbergh to honorary active duty to help evaluate the readiness of the Service for a potential war. 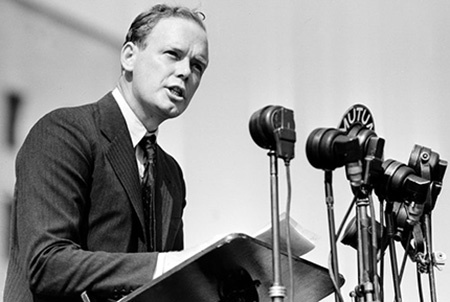 Lindbergh campaigned for non-intervention in what was then a European War. In 1940, he became the most recognizable spokesman for the America First Committee and was heard by millions on the radio in speeches from Chicago's Soldier Field and Madison Square Garden. President Roosevelt called his loyalty into question and he felt he had to resign his commission in the Air Corps Reserve. After Pearl Harbor, Lindbergh tried to have his commission reinstated, but the Roosevelt administration denied his requests. 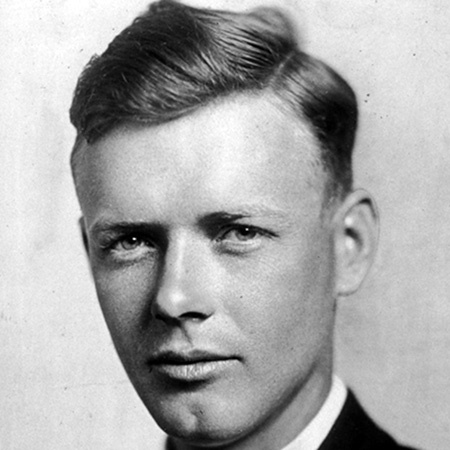 As a civilian, Lindbergh offered his services to the aviation industry. Ford hired him to help troubleshoot early production troubles with the B-24 Liberator bomber program, which was built at the automobile company's Willow Run Plant. Once Liberators began smoothly rolling off the line, he joined United Aircraft as a consultant to the Chance-Vought Division. 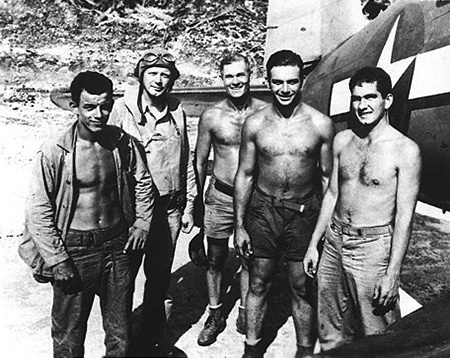 He became the manufacturer's representative in the Pacific Theater, and his accomplishments included teaching Marine pilots how to launch the F4U Corsair fighter-bomber with nearly double the rated bomb load and shared "fuel-leaning" techniques with P-38 Lightning pilots which increased the fighters' combat range significantly. He also managed, as a civilian, to fly on at least fifty combat missions. After the War, Lindbergh was called upon as a consultant to the Chief of Staff of the US Air Force and for Pan American World Airlines. Toward the end of his life, Lindbergh became a strident environmentalist and campaigner for the preservation of endangered species, especially in Hawaii where he spent his final years. Species which receive personal attention include the humpbacked whale, the Blue Whale, the Philippine eagle, and the Tamaraw (a species of dwarf water buffalo native to the Philippine Islands). Charles A. Lindbergh succumbed to lymphoma at his home in Maui on August 16, 1974. He was 72. Lindbergh's remains rest on the grounds of the Palapala Ho'omau Church in Kipahulu, Maui. For other aviation adventure series, see also: Air Adventures of Jimmy Allen, Airplanes and Pilots in Old Time Radio, Anne of the Airlines, Air Stories of the World War, Captain Midnight,Hop Harrigan, Howie Wing, A Saga of Aviation, Rare Aviation Old Time Radio Shows, Airmail Mystery, Sky King, Speed Gibson, Tailspin Tommy, Terry & the Pirates, Sky King, Sky Blazers, Amelia Earhart, and Smilin' Jack. Amazing collection of recordings. I really enjoyed it.